Our super efficient 'Gemini' radiant space heaters are perfect for use anywhere focused heat is needed fast! The Gemini heater offers instant localised heat when you want it where you want it. You don't have to worry about high fuel bills as these heaters produce heat straight away and use far less energy to heat up a space than conventional heating products. Also the Gemini heaters operate silently and do not move the air around making them the perfect choice for containing dust particles, helping to reduce allergies in the workplace environment. 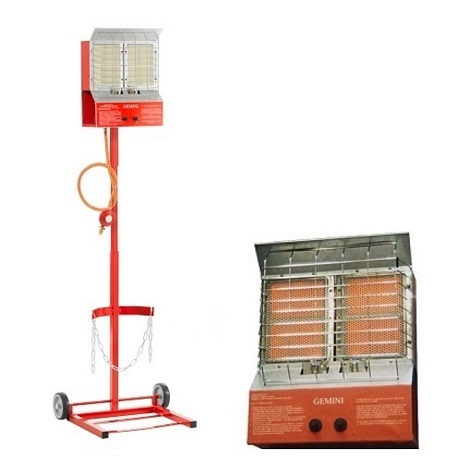 The safest gas fired heater you can buy! * The Gemini incorporates an Oxygen Depletion System that senses the oxygen content of the air and turns the unit off if the oxygen content falls to an unsafe level for personnel working nearby, thus ensuring their safety. Polyester powder paint coated telescopic heavy duty tubular steel frame. Tower units have bottle holder in base with adjustable securing strap. IN STOCK! Gemini mobile space heaters are ready for delivery.